Spain's Princess Cristina and husband, Inaki Urdangarin (right), leave a makeshift courtroom on Monday, the first day of a corruption trial. She is accused of tax fraud and is the first member of Spain's royal family to face criminal charges. Spain's hilltop Royal Palace towers over working class barrios across the Manzanares River, on the west side of Madrid. The area is home to Magdalena and Margarita Rodriguez Prado, two sisters in their late 60s, who huddled under a wall-mounted TV on Monday in their local chocolate and churros shop, glued to footage of Princess Cristina's trial. Infanta Cristina de Borbón, 50, is one of King Felipe VI's two older sisters. She went on trial Monday accused of tax fraud. "I think she's a good person, but my God! The mess she's gotten herself into!" Margarita says. "It's such a shame!" Magdalena chimes in. "I'd like to think she's not guilty, because I love the royals and I love Spain. And we remember their beautiful wedding." In 1997, Cristina married a dashing athlete — Iñaki Urdangarín, an Olympic bronze medalist in handball in 1996 and 2000 — whom she'd met at the Summer Games in Atlanta a year earlier. The groom caressed the princess's face at the altar of Barcelona's cathedral. Spanish señoras of a certain age, like the Rodriguez Prado sisters, still swoon. But fast-forward nearly two decades and Cristina sits not on a throne but on a wooden bench in the defendant's dock at a makeshift court. She and her husband are on trial with 16 other people, all accused of helping to embezzle $6.5 million in public funds through a supposedly nonprofit sports foundation run by Urdangarín. The princess is charged with two counts of tax fraud and faces up to eight years in prison if convicted. For Urdangarín, it's worse. He's charged with more serious offenses, including money-laundering and forgery, and could go to prison for nearly 20 years. 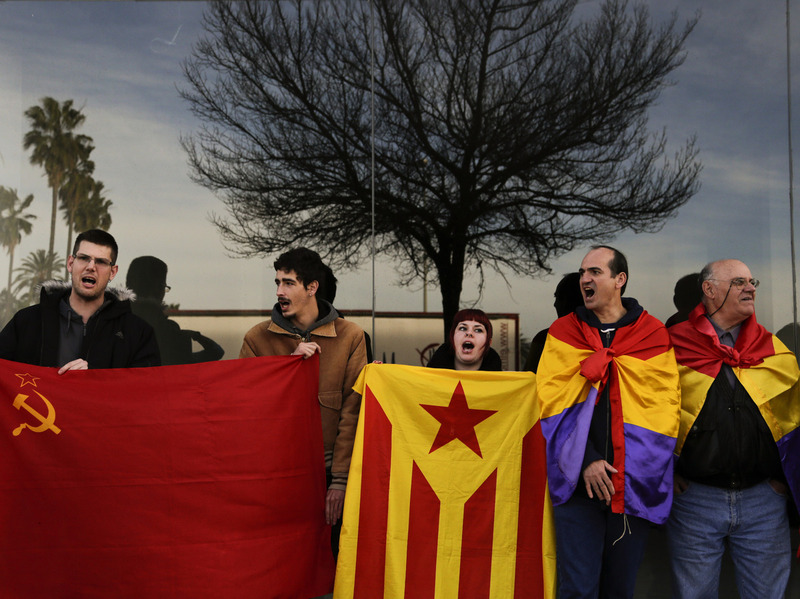 Anti-monarchy protesters gather Monday outside a makeshift courtroom after the arrival of Spain's Princess Cristina, in Palma de Mallorca. "Normally, it's very difficult to defend against a tax offense in Spain, and when it gets to this level [a trial], it's because the case is difficult. They normally end up in convictions," says attorney Ignacio Sanchez, a white-collar crime expert at Hogan Lovells, a law firm with offices in Madrid. "But there are a lot of settlements out of court — with the defendant admitting guilt, paying a fine, but avoiding prison time." Cristina's defense appears to be two-pronged: She denies knowledge of her husband's business dealings and repeated the phrase "I don't know" 182 times in response to a judge's questions at a February 2014 pretrial hearing, according to a transcript. Her lawyers also want her case dismissed because charges were brought by a private anti-corruption group, not Spanish authorities. (A quirk of Spanish law allows this.) In fact, Spain's tax authorities have sided with the princess, arguing for an administrative fine rather than criminal charges. But a lawyer for the private group, called Manos Limpias ("Clean Hands"), said Monday that letting Cristina off would "prejudice Spanish justice and prejudice the crown." Judges allowed the case to be brought to trial. The couple spent 13 hours in court Monday, the trial's opening day. They sat apart from one another in the defendants' section and did not address the proceedings. They smiled politely at a handful of anti-monarchy protesters chanting as they passed through a police cordon on their way out. Cristina's lawyers asked the judge to eliminate her from the list of defendants. Another lawyer asked that King Felipe and his elderly father, Juan Carlos, be called to testify as witnesses. But another lawyer said that would turn the trial into a "reality show." Rulings are expected on those motions in February, when the trial resumes. Cristina is the first member of the Spanish royal family ever to face trial. Her fall from grace coincided with the economic crisis, and the rise of public resentment against the monarchy. "My country is broke. Millions of people in the past years became jobless," says Julia Mampaso, who lives in the shadow of the Royal Palace and is among the more than one in five Spaniards who's still unemployed. She says the monarchy embodies the lavish lifestyle Spaniards romanticized during the economic boom years — but then found repugnant when they lost their jobs. "I really think [the monarchy] is a joke. The image this gives!" Mampaso says. "The law should be for all — and absolutely strict. It doesn't matter who you are — a king or a princess. You're still a human being, doing something wrong." Cristina's trial could be the biggest challenge to the Spanish monarchy's legitimacy — even worse than her father Juan Carlos' 2012 jaunt to shoot elephants in Africa, a luxury trip he took at a time when his subjects were suffering the worst economic crisis in a generation. His popularity plummeted, and he abdicated two years later. Spain's economic crisis prompted tax authorities to redouble their efforts to go after fraudsters. There was so much public anger — and the government needed the money. "The tax agency started to be more aggressive, prosecuting cases against soccer players and people who hid money in Swiss bank accounts," says Sanchez, the white-collar crime expert. "There was a political decision to fight tax fraud." And that's what ensnared Cristina. Her trial is being held on the Spanish island of Mallorca — the source of some of the public funds that disappeared. The makeshift court, at a civil servants' training center, sits a stone's throw from one of the royal palaces where Cristina used to vacation — and from the local prison, where she could end up if convicted.